Night Diver. Extend Your Abilities. Extend Your Comfort Level. Expand Your Diving Territory. 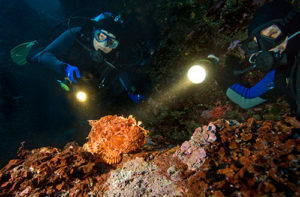 Some of the most remarkable scuba diving you will do may be at night. Also let’s not forget the obvious – it’s cool! I mean really, how many people do you know who are out scuba diving at night? Instead their home watching Seinfeld reruns and getting fat. I promise – you will love to night dive after this class. But be pre-warned, you may want to dive only at night! Price: Private lessons available for $450. per student. includes . . . Specialized Equipment: Dive Lights. One primary, one backup.